Amazon keeps the focus of the Fire tablets very, very mainstream. Thus, we get specs like "HD display with over 1 million pixels." You can get a little more detail if you dig in. That display is 1280x800, and there's a 1.3 GHz quad-core processor with just 1.5 GB of RAM. You don't need a ton of RAM with Amazon's simplified Fire OS, which is still based on Android Lollipop. You'd be hard-pressed to spot any difference between the new tablet and the last refresh. As far as we can tell, the only improvement is hands-free Alexa. So, you can shout at the tablet from across the room and have it do things with Amazon Alexa. 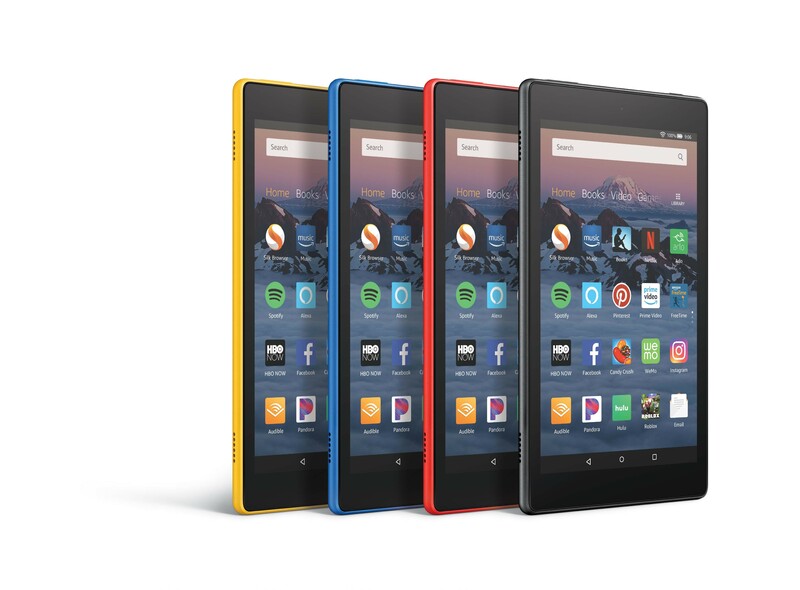 The Fire HD 8 comes in black, yellow, blue, and red colors for $79.99 with 16GB of storage—32GB will cost you $109.99. Both versions ship on October 4th. The same device will also come in a Kids variant with a rugged case and no-questions-asked warranty. SEATTLE--(BUSINESS WIRE)--(NASDAQ: AMZN)—Amazon today announced the next generation Fire HD 8—now with always-ready, hands-free access to Alexa. With up to 10 hours of mixed use battery life, the all-new Fire HD 8 offers a stunning 8” HD display with over 1 million pixels, a quad-core processor, 16 GB of internal storage with support for up to 400 GB more, plus hands-free access to Alexa—only $79.99. The all-new Fire HD 8 is available for pre-order today at www.amazon.com/firehd8. Fire tablet customers who are Prime members have access to the best of Amazon entertainment because Prime is better with Amazon Devices, and Amazon Devices are better with Prime. Over 100 million paid Prime members around the world enjoy an unparalleled combination of shopping and entertainment. In the U.S. this includes unlimited access to award-winning movies and TV episodes, such as Manchester by the Sea, Tom Clancy’s Jack Ryan, and The Marvelous Mrs. Maiselwith Prime Video; unlimited access to Prime Music, Prime Reading, Prime Photos, Twitch Prime; early access to select Lightning Deals; one free pre-released book a month with Amazon First Reads; and more. Prime members also receive deep discounts on select popular products at Whole Foods Market, plus an additional 10 percent off hundreds of sale items. Prime was built on the foundation of unlimited fast, free shipping, and members receive Prime FREE One-Day Shipping and Prime FREE Same-Day Delivery in more than 8,000 cities and towns, two-hour delivery with Prime Now in more than 30 major cities, and unlimited FREE Two-Day Shipping on more than 100 million items. If customers are not yet Prime members, they may be eligible for a 30-day free trial of Amazon Prime at www.amazon.com/prime. Amazon says the new Fire HD 8 will ship with an updated version of Fire OS that is based on Android Nougat. Neat.